Luka Doncic of Real Madrid was back to his magic self on Friday night in the Serbian capital. Not only did the teenage superstar hit a game-winning three-pointer in a 79-82 road win over Crvena Zvezda mts Belgrade, which kept Madrid in the race for home-court advantage in the Turkish Airlines Euroleague Playoffs, but he also gave an outstanding all-round performance to earn the MVP of the Round honor. 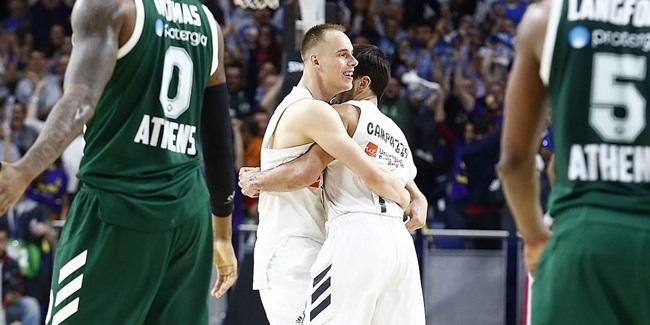 Doncic had a performance index rating of 35 by scoring 24 points, making 4 of 5 two-point shots and 3 of 7 three-pointers, including a game winner with 0.9 seconds on the clock. Doncic grabbed 9 rebounds, dished 4 assists, had 3 steals and drew 10 fouls. This marked the fifth time this season Doncic accumulated an index rating of 35 or higher, and no other player has done it more than once. This is Doncic’s fourth MVP of the Round honor this season, and the eighth in his career. In that same game, Zvezda's center Alen Omic had a performance index rating of 30, his career-high and the second best of this round. Omic amassed a personal-best 25 points on 11-for-13 two-point shooting, and pulled down 10 rebounds. Thomas Heurtel of FC Barcelona Lassa had a PIR of 29 in big road win over Anadolu Efes Istanbul, posting 20 points, 9 assists and 2 rebounds in just over 20 minutes on the floor. Kevin Pangos of Zalgiris Kaunas posted a PIR of 28 in a 85-73 win over league leader CSKA Moscow. Pangos starred with 15 points and 11 assists, along with 2 rebounds and 2 steals. Rounding out the list of top performers is Nicolo Melli of Fenerbahce Dogus Istanbul with an index rating of 27. Melli collected 12 points, 10 rebounds, 2 steals, 1 assists and 1 block in a road win over Khimki Moscow Region. Omic’s career-high 25 points were the most scored by any player this week. Khimki’s Alexey Shved remains the runaway league scoring leader with 21.7 points per game. Nikola Milutinov of Olympiacos Piraeus led all rebounders in Round 29 with 12 boards, tying his career-best. James Augustine of Unicaja Malaga leads this season’s rebounding charts with 6.9. Pangos led all players this round with 11 assists. Nick Calathes of Panathinaikos Superfoods Athens, who had 10 assists this round, leads the EuroLeague by averaging 8.2 per game. Doncic had 3 steals, more than any other player in Round 29. Calathes is the league leader in this category with 1.7 per contest. 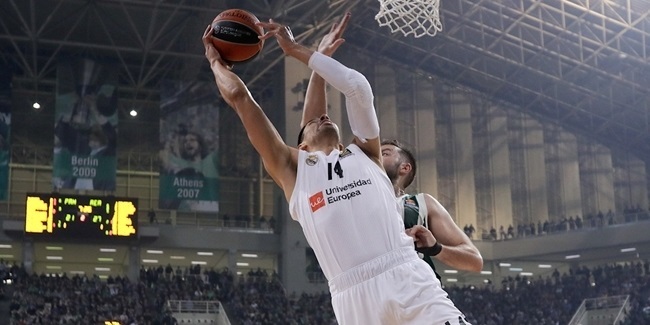 Five players had 2 blocks in Round 29: Adreian Payne of Panathinaikos, Arturas Gudaitis of AX Armani Exchange Olimpia Milan, and the Maccabi FOX Tel Aviv trio of Alex Tyus, Artsiom Parakhouski and Jonah Bolden. Bryant Dunston of Anadolu Efes Istanbul leads all the EuroLeague shot-blockers going into the final round of the regular season with 1.7 per game. There were five double-doubles this round: Omic with 25 points and 10 rebounds, Melli had 12 points plus 10 rebounds, Milutinov collected 10 points and 12 rebounds, Pangos had 15 points and 11 assists, and Calathes had 17 points and 10 assists. 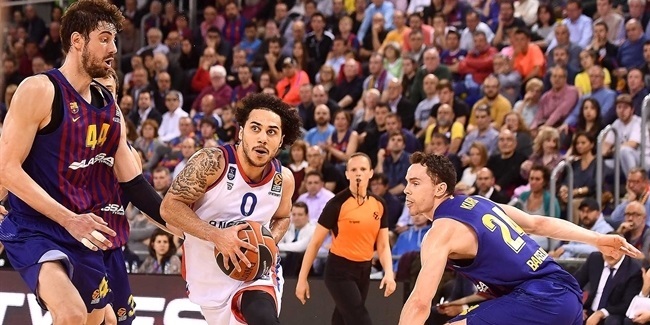 On a near-perfect night for Anadolu Efes Istanbul, guard Shane Larking was close to perfection himself as he became MVP for Game 3 of the Turkish Airlines EuroLeague Playoffs.